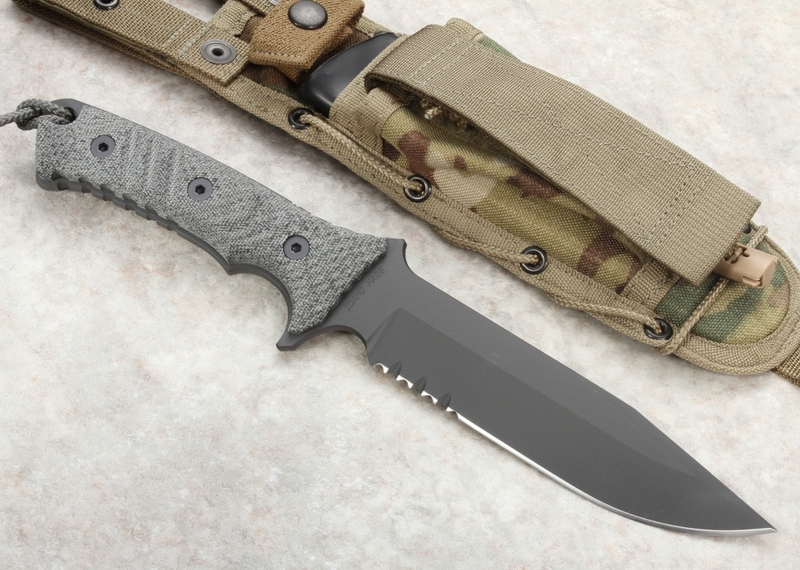 The Chris Reeve Pacific Knife features some of the highest grade materials and craftsmanship available to honor the 50th anniversary of the US Military's 1st Special Forces Group (Airborne). 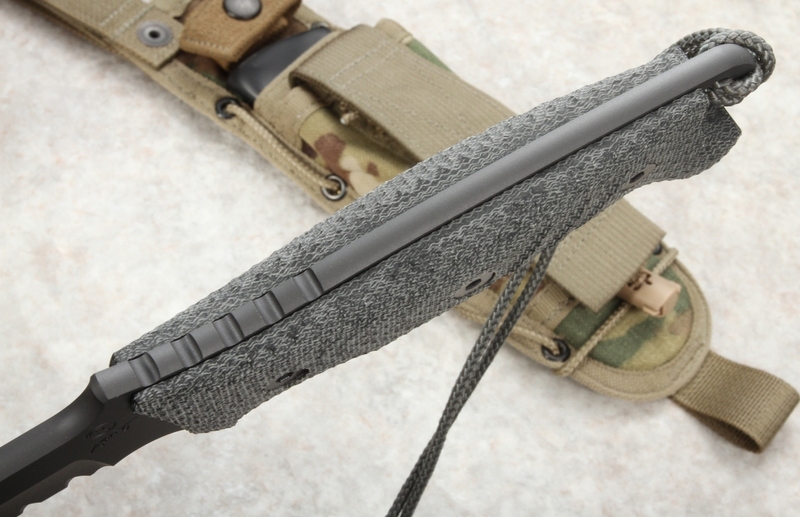 With its beautiful KG Gun-Kote finish, blasted black canvas handle, and matching sheath, the American-made Pacific is a fitting addition to anyone's field gear bag. This Chris Reeve Pacific fixed blade knife is ideal for cutting through tough material with its serrated edges located at the base of the 6" CPM S35VN stainless steel blade on both sides. 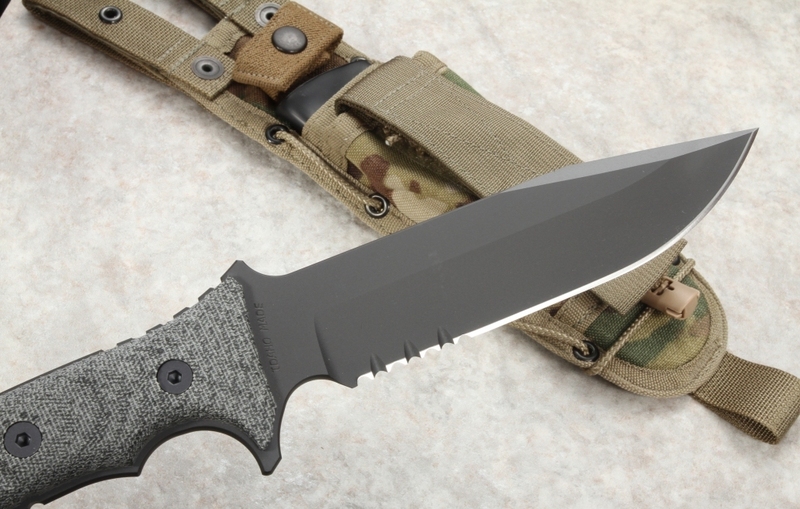 The blade shape is a fighter/Bowie style with a long clip point blade and deep hollow grinds. 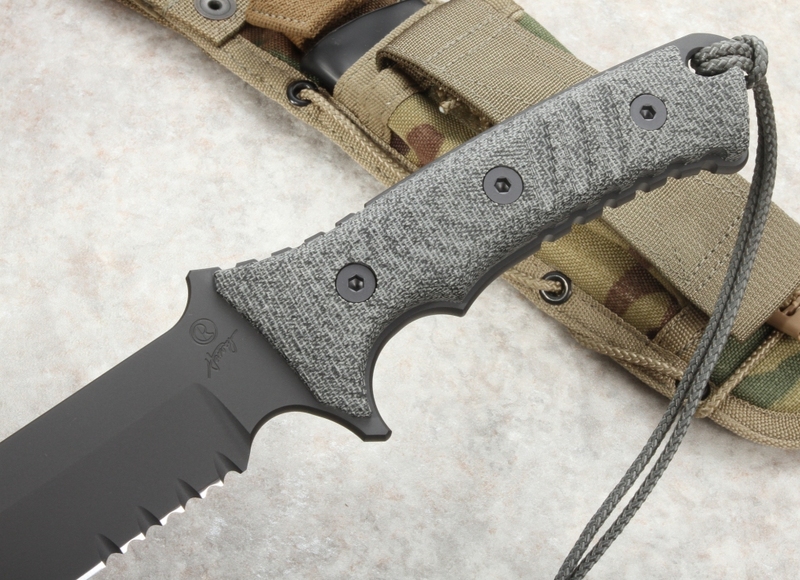 The 55-57 RC hardened stainless steel blade is finished with KG's Gun-Kote for optimal protection. The KG Gun-Kote material was originally developed for military purposes, but its efficacy in protecting metal from the elements has led to it being used in civilian products as well. Your Pacific will accomplish just about any task you put it to and come out unscathed thanks to KG's Gun-Kote finish. Measuring in at 11.5" and 11.6 oz, the Pacific is lightweight for its size and is easier to handle than it might look. 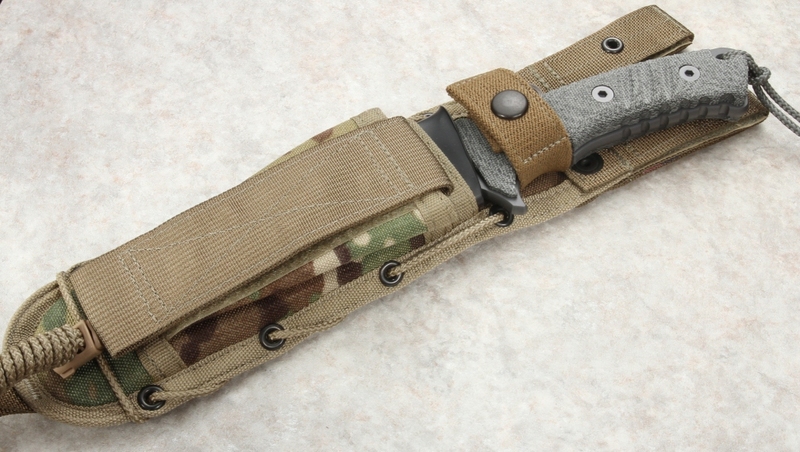 The knife comes equipped with a SpecOps ACU Combat Master sheath for carrying and easy access at the waist so your Pacific is always within reach when you might need it. The Pacific also has the added feature of having a glass breaker at the end of its handle if an emergency situation where breaking through a glass surface is necessary should present itself. The Chris Reeve Pacific handle/tang has enhanced groves and contour for a solid positive grip. The fixed blade knife has a lanyard hole and cord lanyard, tactical grade sheath and the quality you expect from Chris Reeve Knives. Each Chris Reeves knife comes packaged in a box with a certificate of authenticity from Chris Reeve Knives. Chris Reeve Knives are proudly made in Boise, Idaho - USA. 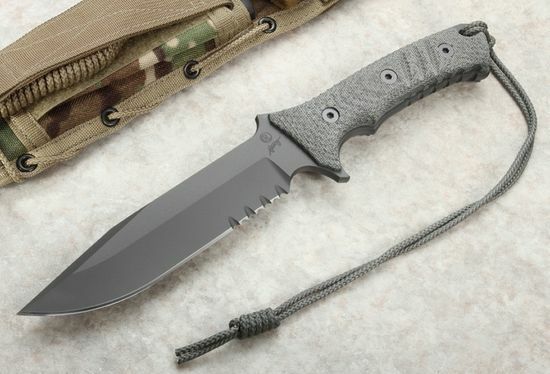 from CRK, "Continuing the proud tradition of Chris Reeve Knives honoring elite military, the Reeve/Harsey collaboration - the Pacific - is the civilian version of a knife (First Group Knife) created to celebrate the 50th Anniversary of 1st Special Forces Group. Based in Ft. Lewis, WA, 1st Group's theater of operations is in Asia and the Pacific, so the name Pacific has been chosen to honor the home and workplace of these fine soldiers." GOT THE KNIFE TODAY. EXCEPTIONAL QUALITY AND SERVICE!! THE FASTEST SHIPPING ON PLANET EARTH! !I AM PROUD TO GIVE THIS TO MY GRANDSON WHEN HE GRADUTES FROM PARRIS ISLAND IN SEPT.,NOW I'VE GOT TO BUY ONE FOR MYSELF. THANK YOU FOR BEING THE BEST!! Outstanding knife, great dealer Knife Art, highly recommended!!!!!!!!!!!!!!! Absolutely incredible knife !! KnifeArt is the best !! The fastest shipping I have ever seen. Thank you so much. Super fast shipping, and excellent, friendly customer service. I immediately regretted selling my first Pacific to a buddy. The newer Pacifics have additional texturing on the handles compared with my first Pacific from a few years back. No true knife collection is complete without IT! It was purchased from Japan. Also I want to also buy here] if the opportunity arises. It is a great knife. Thanks KnifeArt! I received this knife a week ago. Solid & quality & reliable. Only this words have been in my head every time I take Pacific in hands during last week. Knife is absolutely fantastic! Good balance, proper weight - not too heavy to make hand tired quick, but not too light to make field & forest tasks become impracticable. 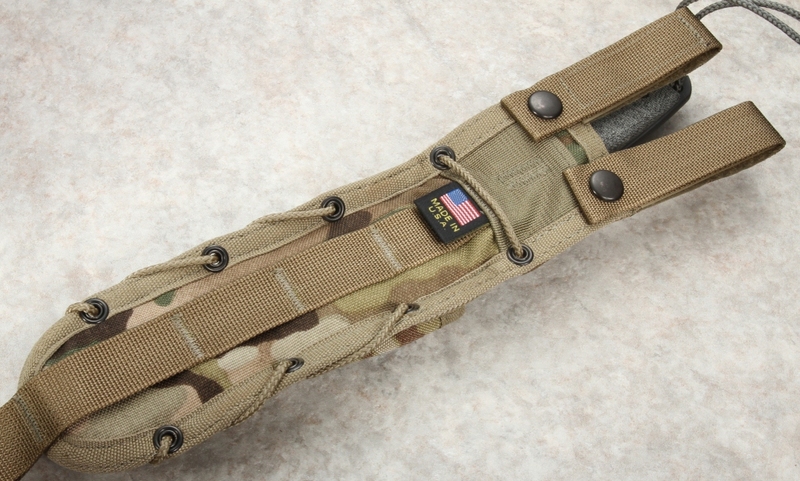 Micarta grip provide very warm feelings and grippy enough to safely fix knife in your hand. Proper steel is a good point too. After one day of hard use in forest sharpness is still at the high level. And sheath - great! Very universal fastenings - you can mount sheath in many ways. After all - amaizing forest and survival knife! Knife is all it is said to be. Sweet bit of Gear. KnifeArt guy,s are a pleasure to deal with excellent service prompt shipping and follow up. I am very thank you for this trusted Seller. Excellent Product! 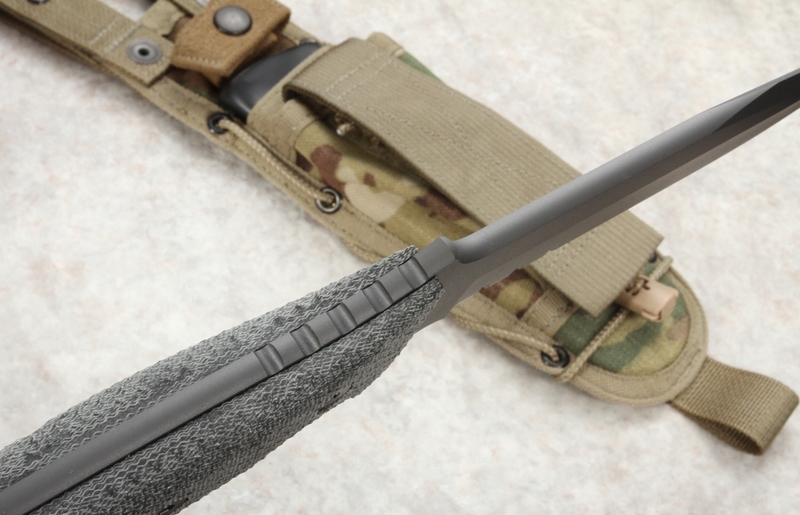 Reduction in number of blade serrations has allowed this Harsey design to better fulfill survival and bushcraft field tasks. When trigger finger is under ricasso and thumb on top, the blade edge is just below tip of thumb. Now this knife can be used for smaller and more delicate work.